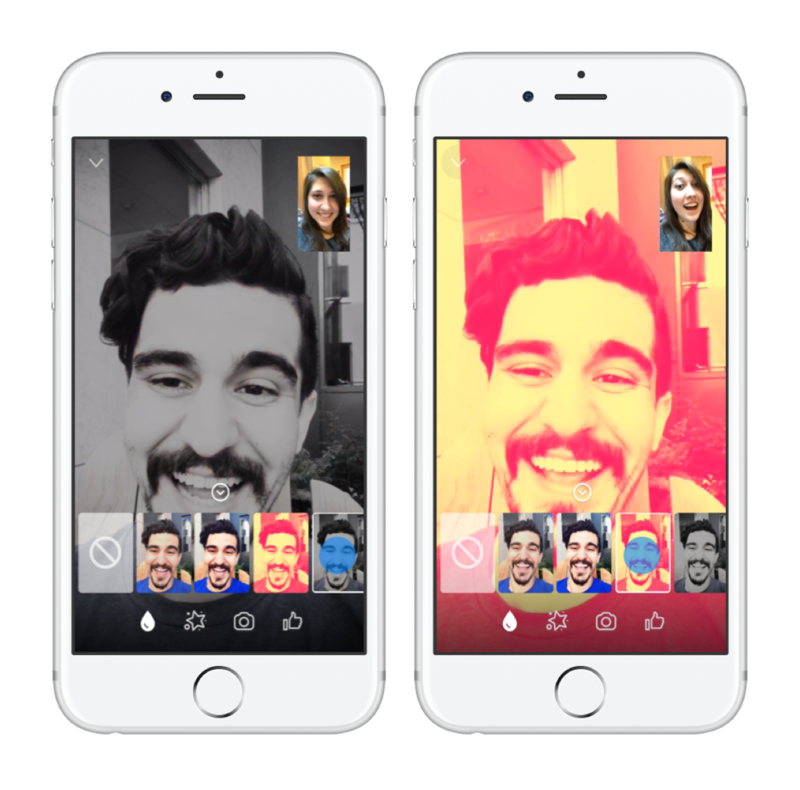 Video chats with your friends and family in Messenger just got a whole lot more fun. Check out the awesome new features—like animated reactions, filters, masks and effects, and the ability to take screenshots—available for one-on-one and group video chats. You can now share your emotions with a reaction, add a filter to feel like your best self, make someone laugh with a bear mask, and even take pictures of your time together. Look and feel like your best self or express your current mood with Messenger’s new video filters. Choose from a variety of filters, ranging from subtle lighting tweaks to bold color changes—like black and white, red, or yellow. Red not your color? Don’t worry, we’ve made sure the live preview allows you to test the filter on yourself before letting others see it. Masks in Messenger have been available for a while, but they’re even more fun now with a bunch of new ones to choose from. Some masks have hidden effects, like reacting to your facial movements. (Hint: try opening your mouth while using the rabbit mask…) We have also added animated effects, like falling hearts and twinkling stars, to give your video chats expressive flair. Check out what happens when you wave your arm in front of the camera while using one of those effects! Unlike reactions, masks and effects stay on the screen for the duration of the video chat (or until you take them off or switch to another one). People like to take screenshots of their video chats and share them with friends—whether that’s one-on-one with your sibling or in a group with your best friends. 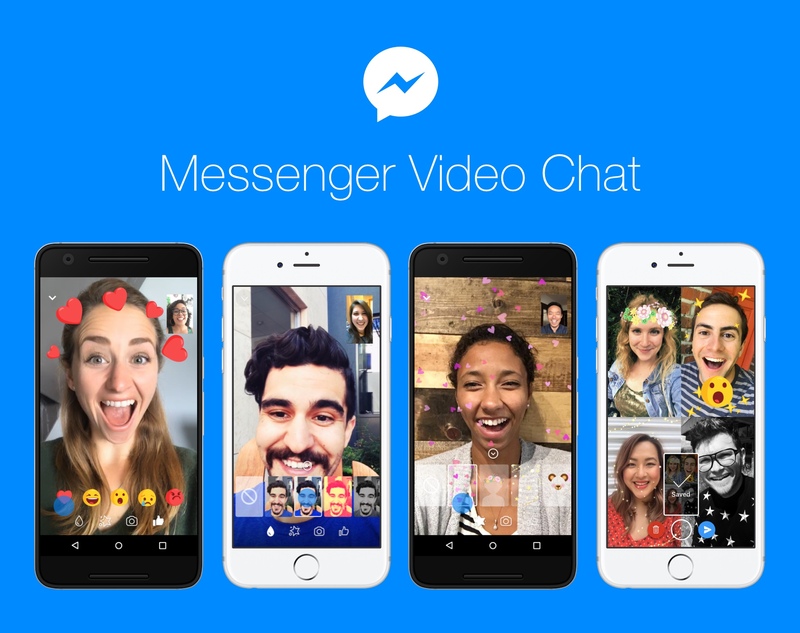 Messenger video chat now has a new feature to easily capture and share your memories. Simply tap the camera icon to take a picture of your video chat to save it to your phone’s camera roll. From there, decide if you want to post it to your Messenger Day or other social media accounts. You can also send the picture to the person or group that you’re video chatting with. So, throw on a love reaction, black and white filter, or flower crown mask and snap a pic with your friends and family. We know the Messenger community ❤️’s reactions—we hope you love these next generation features just as much.